Exhibition Stands, Exhibition Stands UK, Exhibition Services | 200m2 | Exhibition props with a difference Miss Moneypenney! Exhibition props with a difference Miss Moneypenney! Every week clients are asking us at 200m2 Exhibition Stands for ideas on how to make their exhibition stands more appealing. Experiential marketing is the new buzz phrase in exhibition services – how can you use your exhibition stand to provide an experience which attracts a greater number of visitors? By allowing the visitor to interact with your services and products, you are providing a solid and longer lasting connection with the brand. We received one of the best requests last week! During a family viewing of the latest Bond film “SKYFALL” my client was hit with one of those “Eureka” moments, resulting in a potential theme for his next exhibition….. BOND….. James Bond! Bond’s Aston Martin DB5 from the movies Goldfinger and Thunderball sold for a huge £2,800,000 in 2010 (at the time that was the most expensive piece of film memorabilia ever sold at auction). Ok so we can strike this one off the list! How about having a exhibition prop such as a replica gun from a Bond film? This might scare the customers on the stand to start buying… and quick! One of Sean Connery’s Walther PPKs recently sold for £277,250 at auction. And guess what? The auction item didn’t even make it into the film – it was just used for a promotional poster! 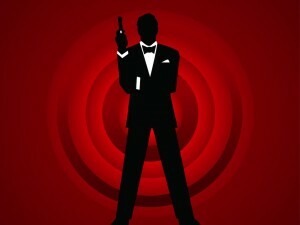 At a Bond exhibition, it would be easy to let time slip away. Bond’s watch from the film Skyfall sold for £157,250 at a recent Christie’s auction. I wonder if they included all the accessories in the price! Sometimes exhibition props can be a gamble… the poker table from ‘Casino Royale’, for example, sold for £85,250! Given these prices, hiring such items for a week could be expensive… and then there’s the exhibition insurance to think about! Embracing the concept of ‘experiential marketing’ is important, but we need to keep our eye on the purse strings. Have a theme by all means, but don’t loose focus on your products. If you are using one of our high quality modular exhibition stands, such as TRUSSwire and CROSSwire this will remain the most cost effective way to attract the crowds.